Onirim deals a quick and fun single player port of a highly regarded solo game, but is it deep enough? Onirim is the popular single player game from Z-Man’s Oniverse series. The game is frequently ranked among the best solo board games out there. It is a quick card drafting/hand management game where your goal is to collect eight door cards before time runs out. After getting a hang of the rules and the app, a full game can be played in about five minutes. A game turn consists of playing or discarding a card, then drawing a card to replenish your hand to five. Your goal is to activate eight door cards, two each of four colors. You can do so by playing three consecutive cards of the same color from your hand or by using a special key card when the opportunity arises. Of course there are hazards to be found in the deck, in Onirim they take the form of Nightmares which will force you to burn valuable cards in order to vanquish them. Collect all eight door cards and you win, but if at any point you are unable to draw cards to get your hand to five cards because the deck has run out, the game is over and you lose, no matter how excruciatingly close you are to getting that last door. The game involves constant tactical choices. You can discard a Key card to take a peek at the next five cards in the deck, discarding one (a Nightmare, if you're lucky) and arraigning the remaining four ​how you please to ensure a helpful draw. Do you use this special Key card power, or do you hold onto it as it can be used to immediately put a door in play if a door of matching color gets drawn? Or, do you use it to fend of a Nightmare draw as a Key can be discarded to remove the threat. Each turn makes you pause to think about what to do next, the mechanic of being able to alter the order of the cards you will draw next becomes crucial and provides much of the excitement in the game. The app includes both a tutorial and rulebook. The rulebook is a bit daunting but the tutorial eases you into the game at a comfortable pace, going step by step as you would hope. By the end of the first play-through players will be more comfortable with the available options on each turn, but likely still somewhat unsure of the strategic advantages of each of those options. It will probably take an additional two or three games before you feel like you have a strong understanding of the game. This is a Z-Man game with Asmodee Digital doing the port, so the quality is there as expected. The cards are clear, the symbols and colors are easily distinguishable, the game looks great with the Nightmare animations bringing it to life on your screen. The game is easy to run on a large phone, most actions are done via drag/swipe so the chances for a mishit are low. Not much to say here, this is a solo game. The physical game lists 1-2 players in a co-op game, but that is not an option on the app. There isn’t a campaign or any added play modes, the game consists of you vs. the deck. It is a true port of the physical game. The app allows you to save and return to a game and also keeps stats for you, including win percentage along with best and average scores (judged by number of cards remaining). Each game is scored based on earned points during the game, time spent playing, and cards remaining. High game scores are posted to an online leaderboard so you can see how you stack up against the best Onirim players. The Onirim second edition game that you would find online or in a store comes with seven mini-expansions (if you find an older first edition, it comes with three of those seven). These expansions add a ton of depth and variance to the game. Their absence from the app is noticeable. I had blindly expected the expansions would be available as in-app purchases at some point. After a little digging, Asmodee won’t comment on those plans. I’ll put on my wild speculation hat on and say that if the base app sells well that might fuel the development of expansions, but that’s pure conjecture on my part. This is a smooth, great looking port of a fun, quick solitaire game. The game can appear overly simple and downright easy if you get some favorable draws. Then the next game you can’t avoid the Nightmares or get the necessary card to complete your set of three and the game seems unfair. It is a game of tactical decision making, you will have many small choices to make, but the outcome of those choices almost always comes down to which cards are sitting on top of the deck and you ability to mitigate that using the special cards. It’s a fun balance if you are able to accept that you can often end up at the mercy of the deck shuffles which isn’t unexpected from a solo card game. Things get really intriguing when you consider the addition of expansions. Unfortunately, it isn’t a given at this point that those expansions will make their way to the app. As is, that leaves this app in a tough spot. Onirim is truly a great port of the card game, but it also feels pretty thin without any expansions. There’s a reason the game is now sold with seven expansions, as they add so much variety to a pretty bare bones base game. In late May, Asmodee Digital released an update to Onirim which gives you The Glyphs expansion as long as you login with an Asmodee Digital account (they are free to create). This expansion adds one door of each color which you must open before winning. It also adds eight Incantation cards (two of each color) which act similar to Key cards from the base game in giving you the ability to look into the deck and alter the course of play. The Incantations are especially powerful as you are able to play a door found with them directly onto the table, like the Key cards they can also be played as a normal card of their color to use in a series of three. This is a small update with only twelve added cards, but it certainly adds another big element to the game. The game is more fun with this expansion and we hope the trend continues and more of the expansions follow suite. In July, Asmodee Digital updated Onirim to include Crossroads and Dead Ends as a $0.99 in-app purchase. The update also included the scoring and leaderboards mentioned earlier. Crossroads are Sun/Moon/Key cards (3/2/1 of each, respectively) which can act as any color. Otherwise, they act as any other card of their type. The expansion also adds ten Dead End cards which don't do anything but can't be discarded from your hand individually, they are dead weight. You can choose a new option to discard your entire hand at any time. Overall, this expansion makes Onirim significantly easier than the base game or the base game + Glyphs. There are two reason for this. First, while the Crossroads cards aren't super powerful, they do help and they were added without increasing the number of Nightmares or doors (as opposed to Glyphs). Second, the Dead End cards aren't really that much of a bad thing. I usually like having one or two in my hand as they reduce the number of good cards I must trash if I get caught by a Nightmare I can't avoid. The expansion is a letdown compared to The Glyphs, but if you are looking for an easier game, Crossroads and Dead Ends is a good addition to Onirim. Although we don't love Crossroads and Dead Ends, we feel it does add variety and, along with the scoring and leaderboards, is enough for us to bump up our score to 4 stars. The Door to the Oniverse was released as the third expansion to Onirim. The expansion adds in 17 new cards, one of which is a new door, Door to the Oniverse, which can be opened by any color cards. They still must be three in a row, a key, etc..., but the door can be unlocked with any color. The other 16 new cards are Denizen of the Oniverse cards which are seven unique cards each with a special ability. The cards live in the deck along with the rest, when they are drawn you can choose to discard the Denizen card or discard a card in your hand (not a Dead End card, sorry) to add the Denizen card to your table. When you do so, the card becomes available to use at any point in the game. The cards add a range of abilities which allow you to break the rules of the Onirim world. Playing a card of the same symbol as the last card, trading a location card from your hand with one in your discard pile, and ignoring a Nightmare card by placing it into Limbo are three examples. Like Crossroads and Dead ends, these cards on their own make the game significantly easier, but do add a variety of options. Along with the expansion, the update added two notable features: Achievements and the ability to force the use of the Intersections rule. Achievements are what you would expect, a long list of specific goals you can achieve to get points. The list is long and unique so you can chase them for quite a while if you want. The Intersections rule applies to the Crossroads expansion. A variant of that expansion is called Intersections, it was explained in the rules but not enforced. The rule states that a Crossroads card (one of the wildcards which can be used as any color) can only be used as the second card of a series. This limits its effectiveness and makes the game a little tougher. It is nice to see this added as an option, but playing with all of the expansions is still a much easier task than playing with none or only The Glyphs. These expansions keep adding unique rule-breaking twists to the game, but don't balance that with adding difficulty. As such, we recommend mix-and-matching expansions when you play to keep things more difficult. That or chase high scores and achievements, all of which are quite fun and addicting. 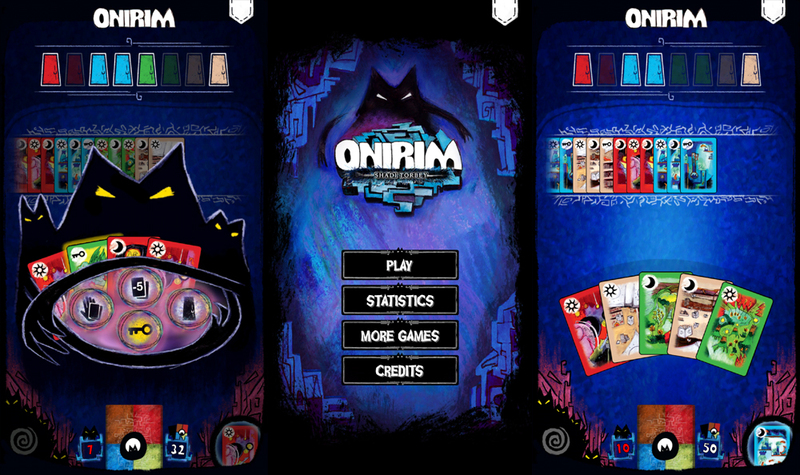 We recommend Onirim in its current state for light, quick solo play.